Download the trailer here (39.9Mb, 2min duration, h264, 1280x720, mp4). Lon Marum is a TV-hour length documentary film depicting the relationship between language, culture, place, music, tradition, and magic – in the context of life on an active volcano. Lon Marum is pursuing its journey and has been preselected for the 2014 Université de Lorraine Festival du Film de Chercheur. Q&A with director and refreshments. Lon Marum means "the path of the volcano" and when applied to the people of Emyotungan it means the "people who live in the path of the volcano". Such is the profound relationship that the people of Emyotungan and West Ambrym have with the volcano. It exists underneath them, the porous volcanic ash soft underfoot is a low-yielding soil. It towers over them, trapping clouds and billowing out poisonous sulphur dioxide in industrial proportions. And it falls down on them in the form of acid rain ruining crops and destroying gardens. It permeates every corner of their existence informing everything from creation mythology through to current land tenure and kinship systems. But the phrase Lon Marum also serves as the metaphor describing the relationship between the people of West Ambrym and the physical environment - and this forms the rhizome of the film's narrative. The volcano features in the film - but as a spirit form, something omnipresent but invisible. The treatment of the volcano as a part of the spirit world reflects the cosmology of greater Melanesia where there is little or no distinction or boundary between the spirit world and the physical world. Magic, music, tradition, and dance are a fundamental part of daily life - all distilled through story and often visually accompanied by intricate sandrawings. We follow a local community leader, and fieldworker for the Vanuatu Cultural Centre, as he takes us on a journey. This journey also reflects the metaphorical quality of "path" or "road" as it pertains to Lon Marum, the path of the volcano. We follow this man as he leads us through his community. It is a community that exists just as much as an abstract concept as it does in reality. It has some of the most complex kinship systems in the world, described by languages on the very brink of extinction, in one of the most linguistically diverse regions on the planet, within a traditional social and economic system which functions much as it did thousands of years ago. The film is made more significant by the fact that 2013 is the centennial anniversary of the biggest eruption of the Ambrym volcano. In 1913, the colonial settlement at Dip Point in West Ambrym was destroyed by a massive eruption. The entire settlement including the hospital and the church sank below sea level. The remains of these buildings now lie just metres below the surface of a briny lake. More recently Western scientists have become interested in the volcano. From all over the world, researchers come and attempt to “know” the volcano. As a laboratory, Lon Marum is a challenging environment. We explore the different ways of knowing represented here by the local community and their complex traditional social systems, at once, fragile and resilient, and the modernist scientific fraternity, equally fragile and resilient. The fascinating dynamics between different cultures, and between people and the environment is portrayed in the affective domain, leaving the audience to ponder exactly what it means to “know” something. This film is a journey. It is a journey through a physical community and through an abstract community. It is tied together not by drama and controversy, not by sensational representation, but by the quotidian experience of the volcano. The film is the story of life and how it expresses itself in the bosom of the volcano. 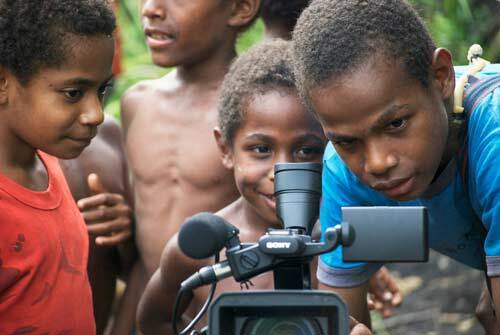 The film was prepared in the context of Ambrym yet without mobile phone so messages were sent through other people or through written message to remote comunities. 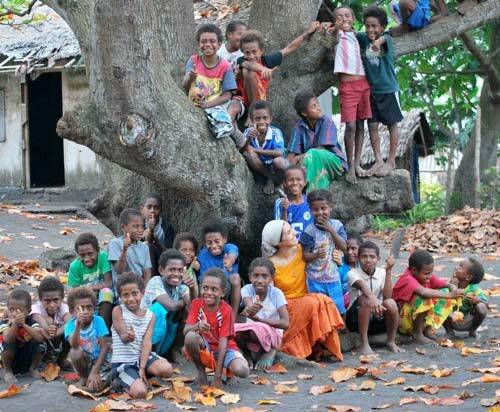 © Vanuatu 2012. All rights reserved. Lon Marum people of the volcano is the result of 2 years of ethnographic work based on the collaboration with Chief Filip Talevu and west Ambrym communities. Chief Filip Talevu is a community leader and ethnographer from Emyotungan village in West Ambrym, Vanuatu. 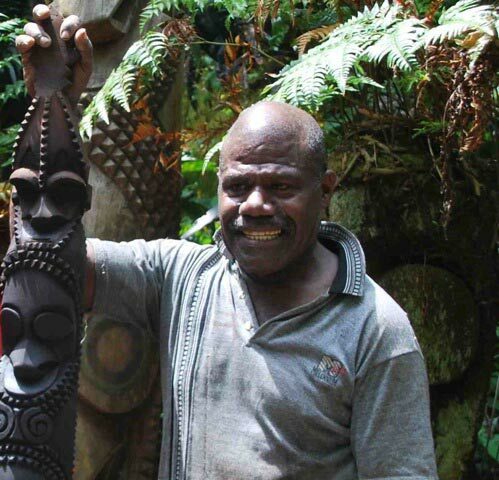 With over 10 years of experience as a fieldworker for the Vanuatu Cultural Center, his numerous contributions spans from cultural consultant, community awarenesses, traditional curriculum building for educators, knowledge preservation and visiting scholars assistance. He is a traditional sculpturor and dancer as well as a living archive of sandrawings, tradionnal games and stories. In addition to Bislama and English, he speaks actively 4 of Ambrym languages. Although, he has assisted film crews in several productions, Lon Marum is his first feature documentary. This film is the result of the 2 years collaborative work with his adopted daughter Soraya Hosni.